Adrian Delia, accompanied by his wife wearing a large draped fun-fur collar in 26C heat, and a full troupe of children because apparently it is now mandatory for the leaders of political parties to use their children as marketing accessories, turned up a full three-quarters of an hour to ‘more than an hour’ late for his own swearing-in ceremony as Opposition leader, leaving the head of state, the Chief Justice and the principal permanent secretary (never mind him) waiting. 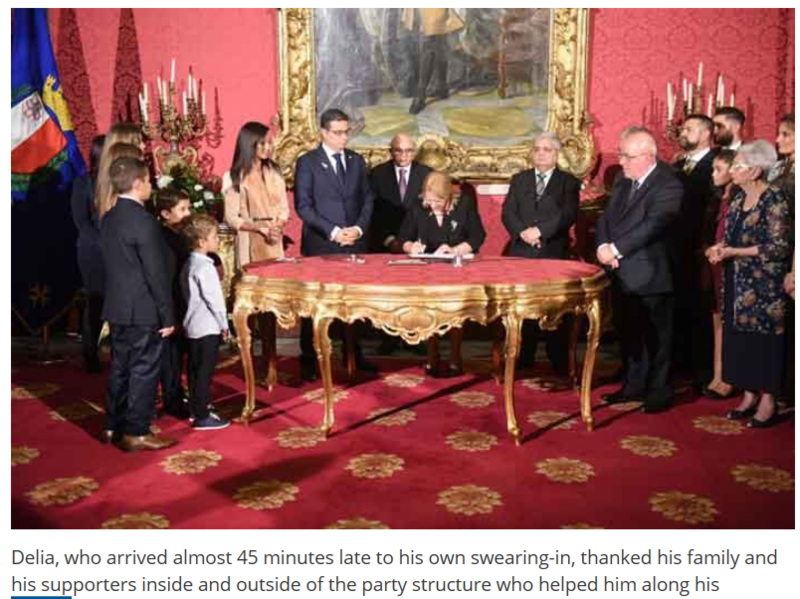 The Malta Independent reported that it was 45 minutes, but the Times of Malta said that Delia was “more than an hour late”. It was actually an hour and 20 minutes late, because the ceremony was scheduled to begin at 5.30pm, which means he should have been there at 5.20pm at the latest, and instead he rolled up at 6.40pm. “You must never forget where you came from,” he said on Xarabank earlier tonight. I hate to say it, but it really shows – and he seems determined to remind us at every turn. What a disgrace. He’s singing from Muscat’s hymn sheet even on this one – except that Muscat wouldn’t have turned up an hour late for a ceremony that celebrates himself, but only for a ceremony that celebrates others. You don’t play power games against yourself.